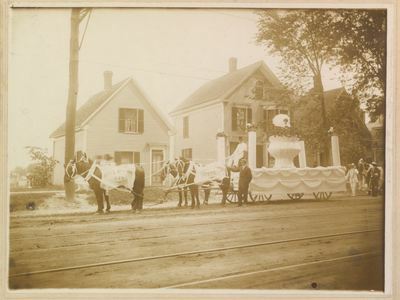 "James A. Robinson & Co. Bangor Carnival Parade Float, June 18, 1912"
"The American beauty float was a fine affair, with a vast bowl of this favorite rose, from which arose a real American Beauty of flesh and blood. Miss Margaret Cullinanl representing the store of James A. Robinson & Co."
The 1912 Bangor city directory lists the owners of James A. Robinson & Co. at 36 Hammond Street as the aforemention James and Perley T. Black. The company were "manufacturers, jobbers, and retailers of clothing, boots, shoes and furnishings, custom tailors, etc." and were "agents for Sorosis, Stetson, and Kum Bak Shoes for Men and Women and Gold Seal Rubbers."